Figure taken from Narbonne et al. 2009, showing the major characteristics of the rangid and charnid rangeomorphs. Although Beothukis is characterised as a charnid, unlike both Charnia and Trepassia, it's primary and secondary branches have been described as 'weakly constrained', allowing them to exhibit morphologies much more like the rangid forms. By possessing both displayed high-order branchs and undisplayed, Charnia-like, primary branches, Beothukis has been considered an evolutionary intermediary that links taxa like Charnia with the rest of the rangeomorphs (Antcliffe and Brasier, 2009). The frondose part of Beothukis is considered to have been oriented upright in the water column, with stalks of proportionally different lengths being present in the two species B. mistakensis and B. plumosa. 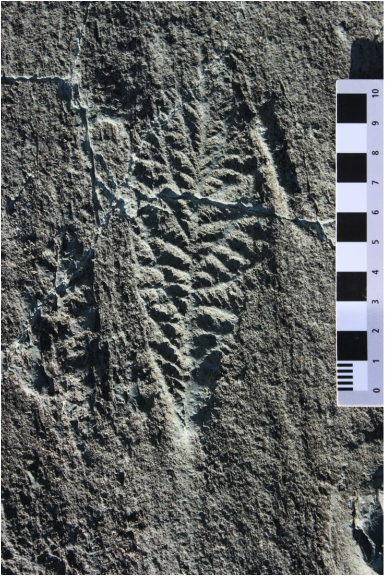 A unipolar rangeomorph frond, sometimes described as 'spatulate' in shape, with primary branches becoming wider towards the margins of the frond. B.mistakensis differs from B.plumosa in possessing a zig-zag central axis and little to no stalk. Beothukis has, to date, only been found in Newfoundland. Diagnosis: A charniid with a single axis of growth and two rows of primary branches, each inclined towards the single terminal growth tip. First and second order branches show axes that tend to radiate away from the central growth axis. The biserial 'rangeomorph' structure of first-order branches is undisplayed and their margins are conjugate and furled. The structure of the second and third order branches is more clearly displayed and their margins are conjugate and furled. No secondary growth tips are present. Beothukis mistakensis from the 'E' surface of Mistaken Point, Newfoundland. Like B. mistakensis, Beothukis plumosa has furled and undisplayed first order branches, but second order branches that are displayed. There seem to only be 4-5 primary branches on either side of the frond, which is considerably fewer than the number seen in other unipolar rangeomorphs. Beothukis plumosa differs from its sister species in the presence of a longer stem, and a linear (rather than zig-zag) central axis. ​Beothukis plumosa appears to have been endemic to Newfoundland with no known specimens being recorded from other regions. Beothukis plumosa from the MUN surface, Bonavista Peninsula, Newfoundland.